At Pro Form Eavestroughing Inc., we are your soffit and fascia installation experts offering unmatched services at affordable prices. We understand that when it comes to your home, you want nothing but the best. Smaller details like fascia, vinyl siding and soffit are often ignored. Yet, these are the elements that prevent your home from water damage and exterior rust issues. 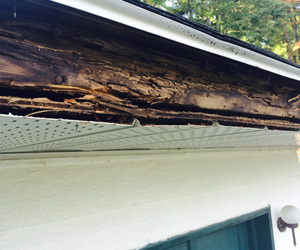 In the long run, soffit and fascia are your home’s saving grace that can save you thousands of dollars in water damage repairs. Brand new soffit and fascia will definitely give your home a new curb appeal in the neighborhood. A new look will not only improve the exterior of the home but it will also prevent it from rust and water damage. Our quality products are virtually maintenance free in the long run and also come at a budget price. Our aluminum soffit will ensure that the crucial ventilation is not sacrificed for style. The components are so made and installed that right flow of air is maintained throughout the construction that ensures there is no build up of moisture to promote mould growth. Plywood is saved and shingle life expectancy increases. Combined with the right eavestrough, soffit and fascia provide the ultimate protection against excess water buildup. Also, water is diverted from foundation, wooden stairs, rusting areas and wooden decks. Our team installs the eavestrough in the right manner that delivers not only performance but also peace of mind. Vinyl siding is any day better choice in comparison to aluminum. It is simply superior in so many ways. It is less prone to dents than aluminum. When it is time to renovate the home exterior, we not only provide products but also recommendations. Whether it is soffit, fascia or vinyl siding, we offer customized solutions that meet your requirements. Our professionals consider aesthetics, form, curb appeal and function to provide the right product. They are situated in the roof and deck overhang. Their primary function is to streamline the home’s build in terms of style and also provide adequate air flow to the attic space. This allows fresh air to enter the setting and thus prevent any build up of the mould and rust in the attic space. 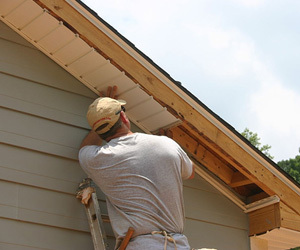 The right soffit and fascia also make for a good foundation for eavestrough. Call Our Professionals For Soffit And Fascia Installation In Ottawa Today.